Avalanche Bulletins – Updated regularly throughout the winter. Parks Mountain Safety – An informative website produced by the National Parks with lots of good info for ice climbers, including lists of climbs and their Avalanche Terrain Exposure Scale (ATES) ratings. Environment Canada Weather – 7 day forecasts for most towns in Alberta & British Columbia. Gravsports-ice.com – popular online forum for conditions, new routes, etc. MCR Reports – reports on climbing conditions from ACMG guides. Canadian Rockies Alpine Guides – Professional guiding service with top climbers & ACMG guides. Courses & guided ascents for all skill levels. CASA – Climbers Access Society of Alberta. Please support them as they work to maintain our access to the mountains. 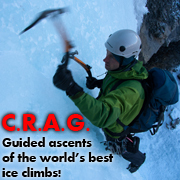 West Coast Ice – info & conditions for ice climbing on the West Coast of Canada. Cold Fear – Info & conditions for ice climbing in Cody, Wyoming. One of the best ice climbing location in the continental United States. Montana Ice – Info & conditions for ice climbing in Montana, including Hyalite Canyon, another good ice climbing location in the US. Alaska Ice – Online guidebook & conditions reports for ice climbing in Alaska. Global Mountain Solutions (GMS) – Difficult Access/Terrain Services – Rope Access Training Calgary-Vancouver -Edmonton, SPRAT, IRATA, Mountain Safety, Helicopter Rescue.